It’s not often that a book on Intelligent Design becomes a best-seller, or is opined (in print) to be one of the best books of the year by a prominent atheist philosopher. 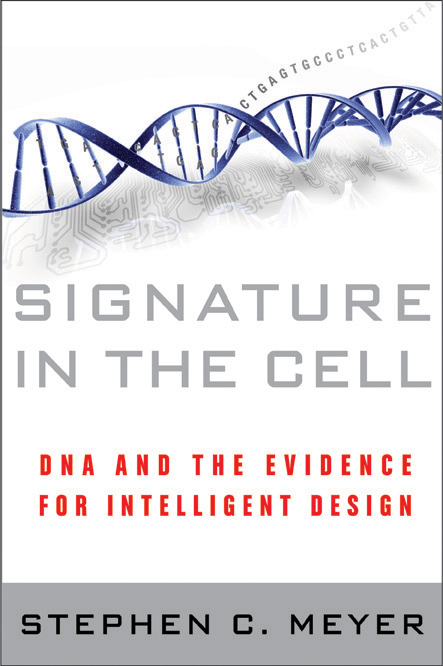 And yet that is true of Stephen Meyer’s book, Signature in the Cell: DNA and the Evidence for Intelligent Design. 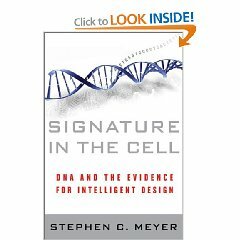 I must say it’s one of the best books I have read on the topic of the evidence for intelligent design in biology. The information was presented in a very logical, systematic order, with each chapter building naturally on the former. Not only was Meyer’s approach systematic, but he presented difficult concepts in very understandable ways. Coming in at 561 pages of text, it is not a quick read, but the time spent is well worth it. Meyer’s thesis is that the origin of life is best explained by an intelligent cause. He begins his book by telling how the mystery of life’s origin was not recognized in Darwin’s day, but came to be realized in the decades that followed as knowledge of life’s complexity began to emerge. That mystery has not been solved over the decades, but rather looms larger and larger the more we discover about the internal workings of the cell, and what is required for even the simplest of life. When it comes to explaining the origin of life (OOL), many think it’s just a matter of explaining the origin of biological complexity. Not so. What needs to be explained is not just the mere complexity of the cell, but the origin of the biological information conveyed by the DNA molecule. But there are two different types of information, so we have to be specific about the type of information we find in the cell that needs to be explained. The first type of information is called Shannon Information, named after MIT engineer Claude Shannon. Shannon pioneered information theory in the 1940s. He noted that information and uncertainty are inversely related, so that information increases as uncertainty is eliminated. Shannon said “the amount of information conveyed (and the amount of uncertainty reduced) in a series of symbols or characters is inversely proportional to the probability of a particular event, symbol, or character occurring.” So “the amount of information conveyed by an event is inversely proportional to the probability of its occurrence.” The greater the probabilities, the more improbable it is that any one event or string of symbols is actualized, and thus that event or string of symbols, if it occurs, will convey more information. Furthermore, probabilities are multiplied as more symbols are added to the mix, so long sequences will always bear more information than shorter sequences. According to Shannon’s definition of information, “nenen ytawoi jll sn mekhdx nnx” has the same information capacity as “Four score and seven years ago” because both strings of symbols contain the same number of symbols, and are equally improbable. And yet, we recognize that the latter is clearly different from the former. What that difference is brings us to the second definition of information. The second definition of information is “the attribute inherent in and communicated by alternative sequences or arrangements of something that produce specific effects,” or what I call “functional information.” This definition does not contradict Shannon’s, but adds an additional component to it, namely functional specificity. Shannon’s definition only measures the amount of information-carrying capacity contained in a particular sequence based on the improbability of the sequence, but it does not distinguish between improbable sequences whose arrangements are specified to perform a function from improbable sequences that are not specified to perform a function. There is a difference, then, between information and meaning. What distinguishes the latter from the former is the specificity of the arrangement to perform a function. To illustrate the difference between Shannon information and functional information, consider U.S. domestic phone numbers. Every phone number consists of a 10 symbol sequence, so each contains the same amount of Shannon Information, and each of the 10,000,000,000 possible phone numbers is equally improbable. While an assessment of the Shannon information content of phone numbers is interesting, it won’t be of much help if you are trying to call your friend in New York, but inadvertently lost the slip of paper you wrote his number on. You’ll need more than just Shannon information to call your friend—you’ll need information that is specified to perform a certain function, namely connecting you to your friend. While all phone numbers are equally complex, they are not all equally specific. Only one specified sequence will connect you to your friend. There is a difference, then, between mere complexity and specified complexity. What type of information does the cell contain? Both. The complexity we find in the cell is not just mere complexity, but also specified complexity: complexity specified to perform a particular function. And the specification we discover is very improbable given the sheer number of symbols (in this case nucleotides, amino acids, etc.) involved. Of all the possible ways to specify the order of nucleotides in DNA and amino acids in proteins, only a limited number of sequences will result in biological function. The information content of the cell cannot be explained in terms of the raw physical properties of DNA because information is not a physical property. Consider a book. While all would agree that a book contains information, where exactly is that information found? Is it found in the chemical properties of the ink and paper? No. The information is found in the purposeful arrangement of those chemical properties by an intelligent agent. The same is true of DNA. DNA is an information-bearing molecule, but is not the source of the information itself. It merely serves as a medium for the information content. I’ll continuing blogging through Meyer’s book next week. Stay tuned. I’m all over this! I’ve read some things Meyer has said before and he is an amazing communicator of complex things. And thanks for posting this, I was trying to point to similar things in my discussion with may7black, albeit, not nearly as clear and concise. I’m surprised you haven’t posted yet on Climategate. The evidence of scientists “cooking the books” on peer review and basic data sheds light on the evolution/creationism debate. If life started with highly complex cells, and they just happened to click in the right order to create complex life, I’d think that would be quite unlikely. But if the cells started off as simple and grew in complexity, then it’s not random or surprising that we’d see what’s around us today. I do not think the evidence supports the idea of any significant man-made global warming, but that’s not a topic I have chosen to take up on this blog. If I had, I would be all over Climategate. This is not the first time climate scientists have been shown to be hiding/exaggerating/mistaking data. As for your comments on the first life, I like you how you say “just happened to click in the right order to create complex life.” Interestingly enough, even scientists have made such statements–faith statements. As you’ll see in future posts, the simplest of all life is so amazingly complex and so amazingly specified that it is beyond the realm of physical possibility to think chance could be responsible for the origin of life. Only those who have faith in materialism could believe it. So there really is no such thing as simple life. And it’s not as simple as things just clicking. They have to be present at the right time, in the right quantities, and at the right place. That presents a problem because the conditions required to create some elements necessary for life are the same conditions that prevent other elements from being created. It’s a real problem for origin of life researchers. The problem is that the creationists think they can keep taking a step backward until their arguments are acceptable. It isn’t going to happen. As an example, let’s say there is a television set where the channels and volume occasionally change. Scientists examine the internal workings of the TV to determine an explanation for the phenomena (eg, power fluctuations causing the set to function improperly). Creationists point over at the couch across the room, where John is holding a remote control and who seems to be pressing the buttons at the same time that the changes occur. Scientists (and the courts) reply that one cannot appeal to an outside entity such as John, and inquiry must be limited to the TV set itself. The creationists respond by claiming that they don’t know who is changing the channel, but the TV lacks the capability to change channels or volume on its own, and that it has a built-in sensor to allow the remote control of the TV. The problem, of course, is that in order for the TV to be controlled remotely, it is implied that there is an entity using the remote control. The forbidden line of thought has merely been changed from an assertion to an intimation. Darwin’s theory of evolution cannot adequately explain the origin of life on Earth. But it’s not intended to. That’s abiogenesis, which has nothing to do with Darwin or Darwinism. Evolution doesn’t explain the origin of life, but how life split into different species after life had already originated. Did you know that one of your posts is prominent in a Youtube video? Taking a step back? If in fact you are right then why can’t scientist take a step forward and create life? They are the ones with the perfect environment and the perfect building blocks. They even can set the lightning bolt to strike and create it as a photo op. “This is Jason Dulle, who was quoted at the beginning and middle of the video. I asked to hear evidence for why God cannot, or does not exist. Nowhere did I say one cannot prove that God exists, so how did my quote contribute to the point of your video? “Ah, but you say I did. You quote me as saying “That is difficult for atheists because it is impossible to prove a universal negative.” But you cut off my statement mid sentence, for I go on to say “unless it is self-referentially contradictory (like a square circle). But there is nothing about the notion of a divine transcendent being that is internally incoherent or self-contradictory. So you are only left with giving reasons to think a divine being probably doesn’t exist.” You conveniently left off that part because it would contradict the point you wanted to make. I don’t doubt that some Christians argue the way you suggest, but quoting me as being one of them is disingenuous for I made the very opposite point. “Furthermore, I find it interesting that the title of your video says the claim “You cannot prove God doesn’t exist” is a lie that Christians tell, and yet you state that one cannot disprove the existence of God! Apparently, it’s not a lie, then. Ironically, as a theist I believe it is possible to disprove the existence of God. One cannot do so empirically (a posteriori), but they can do so philosophically (a priori) if they can show that the very concept of God is incoherent. You seem to recognize this, which is why you flashed the argument from evil on the screen. So why would you say it is impossible to disprove the existence of God? “Furthermore, no Christian philosopher would not say that because God’s existence cannot be disproved, therefore God does exist. But of course they would say that it is possible that he does. But this is nothing more than the claim that anything which can possibly exist, may in fact exist. It doesn’t mean it’s evidence for God’s existence. “You also said one cannot disprove the existence of any particular thing. This is false. One can disprove the existence of a square circle, because the concept itself is rationally incoherent. You confuse empirical proof with a priori philosophical proof. I was able to post part of my response on YouTube, but after just a couple of comments the comments suddenly became “disabled.” Interesting. Update. I was able to finish posting my comments. I can’t say I understand the point you are trying to make in comment #5, so I have no comment at this time for that. What this shows us is that Darwin thought it was possible for natural processes alone to bring about the origin of life by chance. Why did he even bother to think about this problem, and think of it in naturalistic terms? For the same reason many scientists do today: his worldview was materialistic in nature. While Darwin’s theory proper does not speak to the OOL, the worldview undergirding Darwinism assumes that natural processes alone are adequate to explain the origin of life, just like they are adequate to explain its diversification, even if the natural processes involved in each are different. While abiogenesis and Darwinism are separate issues, they are logically related in that both must be accounted for in purely naturalistic terms. Furthermore, if abiogenesis cannot be accounted for by naturalistic processes, why move onto macroevolution when it is logically dependent on the former? If naturalism cannot originate life, then it can never begin to diversifying it. I think the reason many Darwinists want to make the OOL a separate issue from the origin of species is because they know the state of OOL research is abysmal. But what if tomorrow a plausible naturalistic origin of life was discovered? Would evolutionists hold it up as a trophy for evolutionary theory, or would they still be saying that abiogenesis is separate from evolutionary theory and thus the discovery tells us nothing about the cogency of evolution? You can answer that for yourself, but I’m pretty confident it would be the latter! If solving the problem of the OOL can make Darwinism look better, then conversely, not being able to solve it can make Darwinism look worse. The narrator on the YouTube video about the OOL gets it all wrong. He tries to deflate Cameron’s analogy of a painting (that just like a painting implies the existence of a painter, DNA implies the existence of a designer) by saying that a painting is fundamentally different from DNA because paint cannot replicate itself, whereas DNA can. But that is a non-issue, because the question is not about the replication of DNA, but its origin (its coming into being prior to any replication of itself). In the same way one would have to explain how the chemical properties of paint were able to arrange themselves into a specified order to convey a meaningful picture without the aid of an intelligent agent, one would have to explain how nucleotides, ribose, phosphate, and oxygen were able to arrange themselves into a specified order to convey biologically meaningful/functional information. That’s the issue. The narrator builds a straw man when he says “fundamentalists” (which itself is a very poorly chosen word) say scientists claim life popped up out of nowhere. I don’t know anyone who says this. All this guy is doing is telling a story about a logical route. He is not dealing with the issue of chemical plausibility. And notice that he says things like “biochemists THINK they know how the phosphate group formed. They’re now TRYING TO FIND OUT how the ribose attached.” In other words, they don’t know yet. Secondly, I am amazed at how often big claims are made without any proof. For example, how RNA became DNA. That is a huge step that cannot just be stated as if it is a plain fact. There are so many changes necessary for transforming from an RNA World to a DNA-protein world, and so many new cellular machines that are necessary that it cannot be explained as easily as this narrator would have you believe. Of course, the very idea of an RNA World-First is not very sound either, but he just glosses over the problems as if they don’t exist. Rather than getting into further detail, I’ll wait until I get to the part in the series about how naturalistic scientists try to explain the OOL, and why their theories aren’t holding water. Hey, I recently found your blog – thank you for the good work. As an FYI that it’s not showing up properly on the BlackBerry Browser (I have a Bold). Anyway, I am now on your RSS feed on my home PC, so thanks again! With a non-substantive drive-by comment-slam like that, who is calling who ignorant? Don’t you have a substantive, scientific, intellectual response to prove how stupid we are? Or are you content to settle for verbal jabs instead? The last I checked, intellectual matters are settled with arguments, not ad hominem fallacies. Of course, those without a substantive argument don’t have much recourse. This post throws the gauntlet down for your side to respond to, and this is what you come up with? Yes, we theists ought to be trembling in our boots! wow! Great stuff Jason! Keep up the good work! Learning a lot from this and also from your website onenesspentecostal.com My pastor and I share some of your topics over conversation every friday morning after prayer. We go out for breakfast inspired and talk over some of your great thought provoking subjects. Thankyou again! Thank you. And it’s great to hear that my posts are serving as conversation starters for you and your pastor!